Although the Nokia Lumia devices running Windows Phone have an advantage over other handsets (in the shape of the Carl Zeiss optics) the process of taking a photo on this platform is pretty much identical across all phones. What you do with the photos after this, however, is another matter entirely. 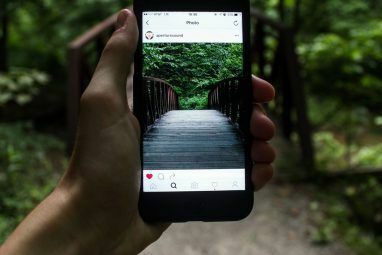 You might share your snaps online with Facebook friends or send to your integrated Twitter account; some users prefer to tweak and style the images first or even use a third party app to take a photo. Great results can be attained with a Windows Phone camera, ideal for family snaps, static closeups and outdoors shots. All Windows Phones are built to the same general specification, which means that holding the camera button on the right-edge of the phone should open the camera app (you can do this from the lock screen by opening Settings > Applications > Pictures + camera > Press and hold camera button to wake up the phone and setting the option to Yes). With the camera software open, you will see the current subject displayed in a large viewfinder, with a few buttons on the right-hand side. The first of these, at the top, will switch your camera to video mode, while the button at the bottom-right with open your phone settings. In between are the zoom buttons – no physical buttons provide zoom functionality. You can take a picture by pressing the camera button, or – if enabled (see Settings > Applications > Pictures + camera > Press the screen to take pictures) tapping the screen. Using the camera settings button (bottom-right of the viewfinder) you can alter some basic settings. For instance, different scene profiles are available such as portrait, candlelight and macro, all suitable for taking snaps in a variety of scenarios. You can set this option to Auto for the phone to choose which is most appropriate. Effects are also available, such as sepia and greyscale. On the right-hand side you will find options for the camera flash – this can be enabled, disabled or set to automatic. You’ll work out the best option for your phone after a few uses. Resolution has a minimum of 640×480 and a maximum that depends on your device: on the HTC HD7, for instance, it is 5M (2592×1944) whereas on the Nokia Lumia 800 a much higher 8M is available. Metering settings are also available for balancing whites and capturing the right colours. Great results can be acquired with a Windows Phone camera – it all depends on how you use it! After snapping photos in Windows Phone you have a choice of where to share them. This can be done by viewing the image in camera mode, dragging the ellipses to reveal the menu and selecting Share…; you can also use your default share, as set up in Settings > Applications > Pictures + camera > Quick Share Account. 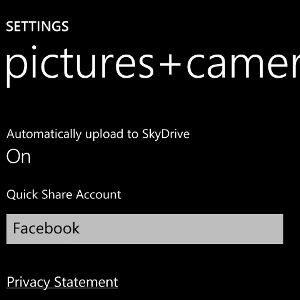 Note that as an additional backup feature you can also activate the Automatically upload to SkyDrive option in the same screen. Sharing options are considerable. Along with all email accounts, native and third party Twitter, messengers such as Kik and even the Windows Phone WordPress app can all handle shared images from a Windows Phone. Note that some of these apps may also have the ability to launch the camera. Various image enhancement apps are also available for Windows Phone: Pictures Lab can crop and adjust images, add filters and is available with a free trial, while Instacam is a free, unofficial Instagram client that offers filters and frames and sharing with various social networks (although uploading to Instagram is currently disabled). 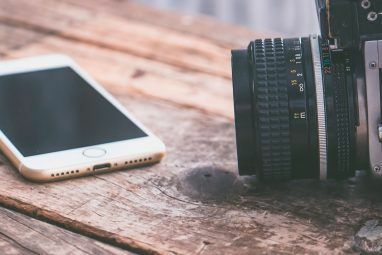 These apps are just the tip of the iceberg, with other software available for creating panoramas, photographing sports and other high-speed activities. You’re limited only by your imagination! Regardless of which Windows Phone device you own, the settings that are available should allow you to get great results, from taking photos outdoors in the sunshine to flash-lit snaps at parties and nights out. The sharing options that are available natively on the platform are excellent, enabling you to keep a backup of your photos (and videos) in your Windows Live SkyDrive as well as sharing them online on Facebook, Twitter and other services. 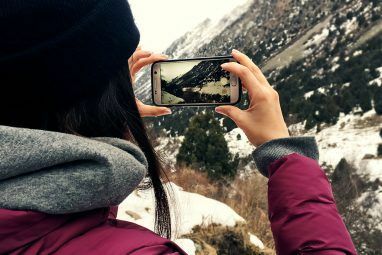 Best of all, the third party apps for Windows Phone cameras have come on in leaps and bounds since the Mango (Windows Phone 7.5) update, with apps enabling the photographing of sports and fast motion, adding Instragram-style functionality and much more. Explore more about: Digital Camera, Photography, Smartphone Photography, Windows Phone, Windows Phone 7. Nice article Christian - I'm actually a bit jealous you can instantly send photos to SkyDrive, that's a sweet feature. The best I can do on my Android as far as I know is install a Dropbox app, but then I have the added step of having to transfer the files from my card to the Dropbox app. It would be really sweet to have a one-touch upload to the cloud like this. Yes, it's one of my favourite features, especially as a dad to very young twins who constantly reveal new facial expressions!